BugZip® Luggage and Clothing Encasements are proven to effectively protect your belongings from bed bugs. Whether you are traveling or packing up your winter clothes to store this spring using BugZip® will reduce the likely hood of your things to get infested with bed bugs. BugZip® Encasements are made out of heavy-duty clear vinyl that resists tears and can easily hold large objects. The specially designed three-sided bed bug resistant zipper allows easy access to your clothes and belongings while “zipping” out bed bugs. All BugZip® Encasements come folded flat in a 10x13x1 inch retail bag which fits nicely in most suitcase pockets for travel. What are bed bugs and why are they a problem? Bed bugs are parasitic insects that feed on human blood. They got the name “bed bug” due to the fact that they are often found living in bedrooms in people’s homes and hotel rooms. Bed bugs are usually seen at night when they are out searching for a host. They are know to easily spread from home to home and hotel room to hotel room by hitching a ride on people’s personal belongings. Hotels try their best to keep these pests out however, even the cleanest hotels can be infested. A bite from a bed bug can lead to other health effects like skin rashes, and allergy symptoms. Bed bugs multiply quickly and are becoming an increasing problem in the United States. This spring, as you are putting away your winter belongings protect them from nasty bed bugs by using BugZip®. BugZip® Luggage Encasements come in four different sizes, a large suitcase, medium suitcase, garment bag and drawer liner. The 3-sided bug-resistant zipper makes it easy to access the contents. 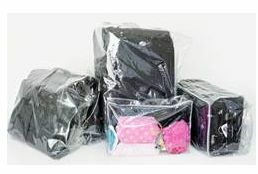 One encasement is large enough to hold shoes, purses, souvenirs and the heavy-duty clear vinyl meets toy industry EN71 standards and California PROP 65 environmental standards. BugZip® can be purchased online at Bugzip.com Amazon.com, USBedBugs.com and at Bed, Bath and Beyond retailers. Healthy Moms Magazine readers can enter for a chance to win a BugZip Luggage Encasement. All you need to do is like BugZip on Facebook, follow BugZip on Twitter, and then leave us a comment to enter. This contest ends on Tuesday January 17, 2012 at 8 am PST and is open to US residents only. For every entry including extra entries please leave a separate comment. Winners will be chosen randomly from the comments and e mails that I receive. The contest ends on January 17, 2012 at 8am PST and is open to anyone in the US. Please leave your e mail address in your comments. All comments without e mail addresses will be disqualified. *Disclosure: I received a BugZip Luggage and Clothing Encasement Drawer Liner and Medium Suitcase Encasement in exchange for this review. All opinions are accurate and 100% mine. Hi there. These bags sound great. I do follow BugZip on FB and Twitter. As I mentioned to your sponsor, these bags would be wonderful for storing hunting clothes. I keep them in rubbermade tubs now. I was just reading the comment before me…huh? I'm thinking it's spam. I am joined to your Blof Frog Community. I like BugZip on facebook and Twitter. I'm following The Healthy Moms Mag on Twitter! I like BugZip on Facebook! Thanks so much for the fantastic giveaway! I follow BugZip on Twitter as Renee Walters2! Thanks so much for the fantastic giveaway! I follow BugZip on Twitter under my twitter name of “FromFurrin” and “like” them on Facebook as “Vicki Vix”. Follow you on Twitter as “FromFurrin”. Subscribe to the Healthy Living Newsletter. “From Furrin” is now following The Healthy Moms Magazine via GFC. “From Furrin” dugg this post. Like The Healthy Moms Magazine on Facebook as “Vicki Vix”. I Follow Bug Zip via Twitter and Like on Facebook. I Follow The Healthy Moms Mag on Twitter. I now follow you on Twitter and Facebook! Thanks!